“The bed is Victorian and was found under the floor of a house. The cane insert is a 70s bed head found on the side of the road. The two pieces combined, are a perfect metaphor for marriage; two distinctly different personalities, beautiful in their own right,coming together to complement each other”. The antique nightdress was entrusted to Coco by her mother in law. 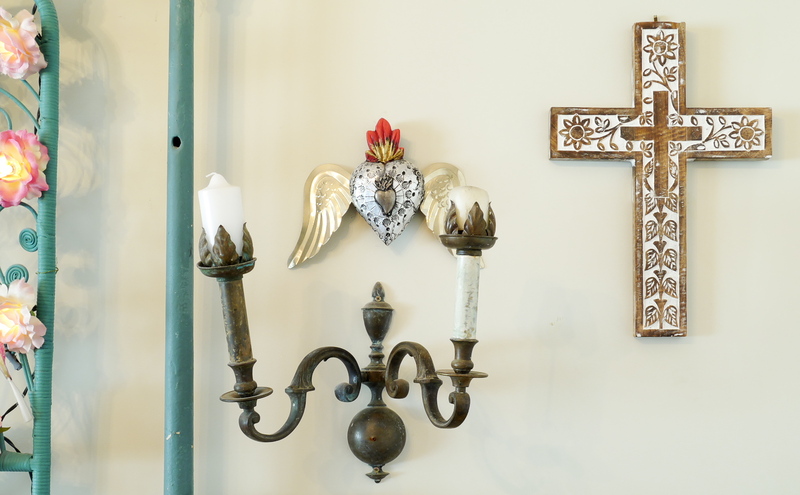 ” I like for things to be seen and displayed and enjoyed. This nightie belonged to my mother in law’s great – great aunt, who was originally from England”. The round picture of a the deer is actually a light catcher bought from an Op shop for the grand total of $1. 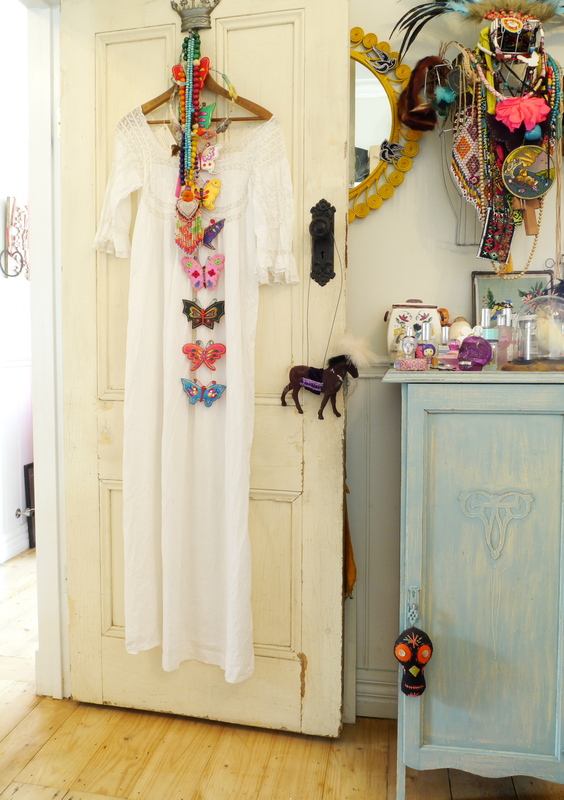 “When I bought it I immediately attached it to the coloured beads I was wearing. The lady in the op shop laughed and said ‘you always have such a knack’ “. 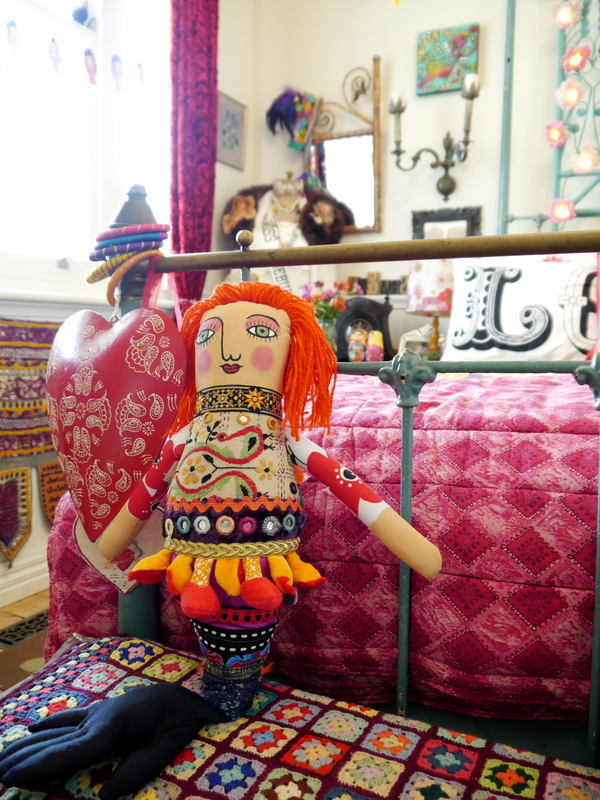 On the other side of the foot of the bed, sits a mermaid doll made by one of Coco’s favourite artist: Rebecca Cool. 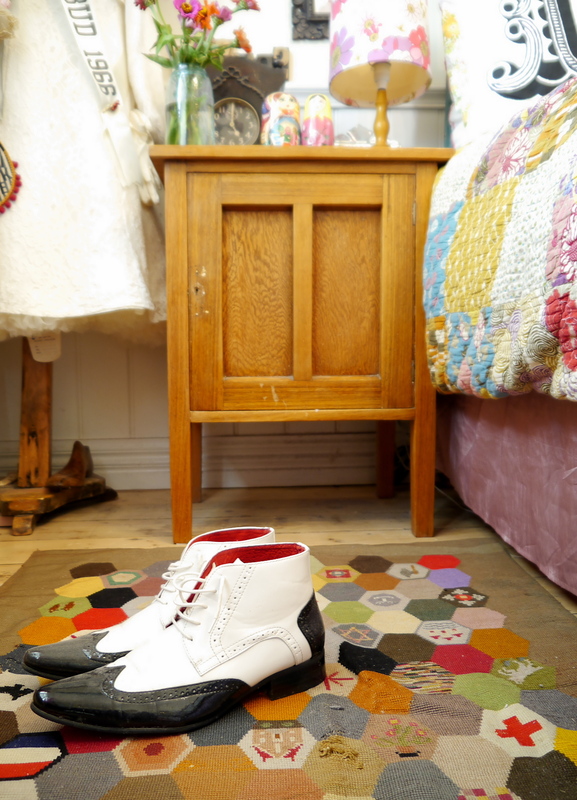 These shoes were worn by Coco’s husband on their wedding day. “When I moved to the Mornington Peninsula I met a group of women who are all amazingly talented,creative and inspiring. Long before my arrival they had formed a group they called the Ya Yas. This name was inspired by the book and the movie ‘The Divine Secrets of the Ya Ya sisterhood’. One Christmas they inducted me into their group and presented me with this hat. They are all so amazing, I feel like if I hang out with them enough maybe their brilliance will rub off on me! When I met this group of women I felt I had met my tribe. They accepted me for who I was, and in doing so, encouraged me to express my individuality. Have you read the story of the Ugly Duckling? This is how it went down!! Even my husband acknowledges that meeting the Ya Yas was a turning point in my life. 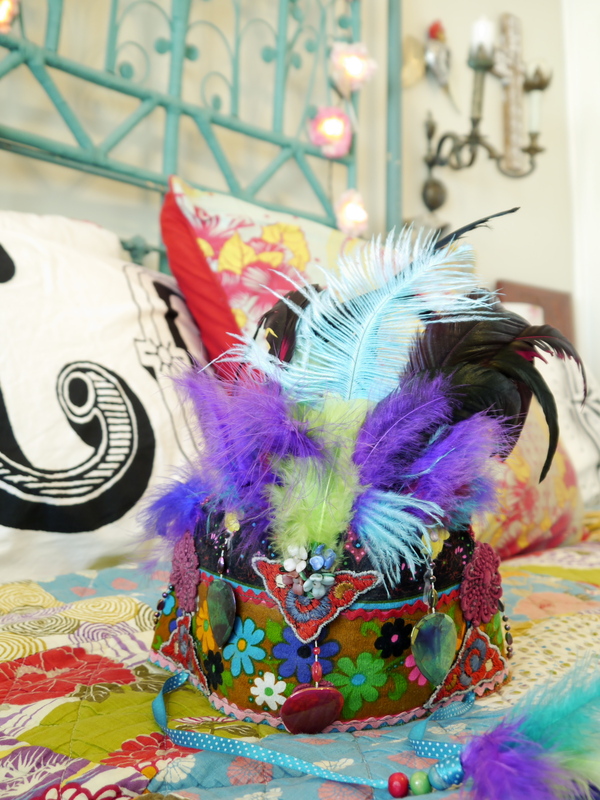 I’m not even joking, if there was a fire, apart from my husband, kids and four legged kids, I would save this hat first”. 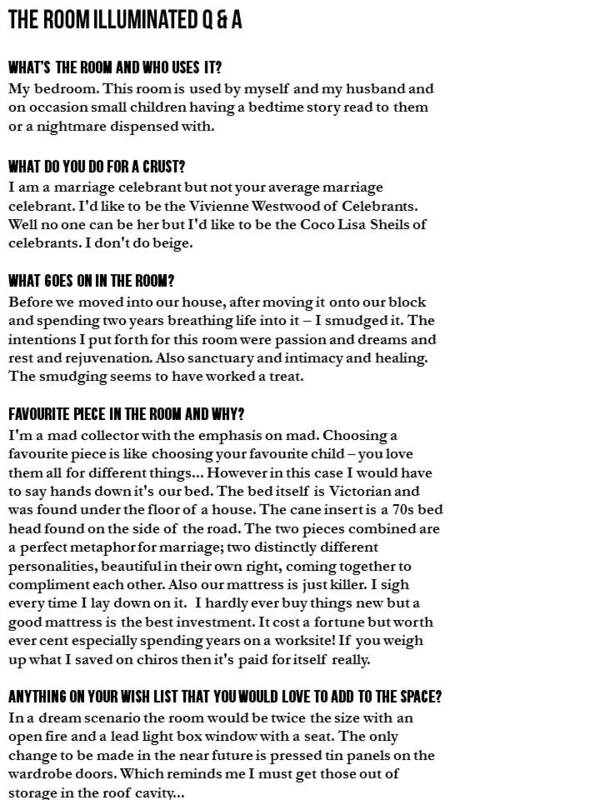 Click here to find out more about Coco, and her work as a ‘not so average’ celebrant for the far from average wedding. 03 Apr	This entry was published on April 3, 2014 at 8:00 am. 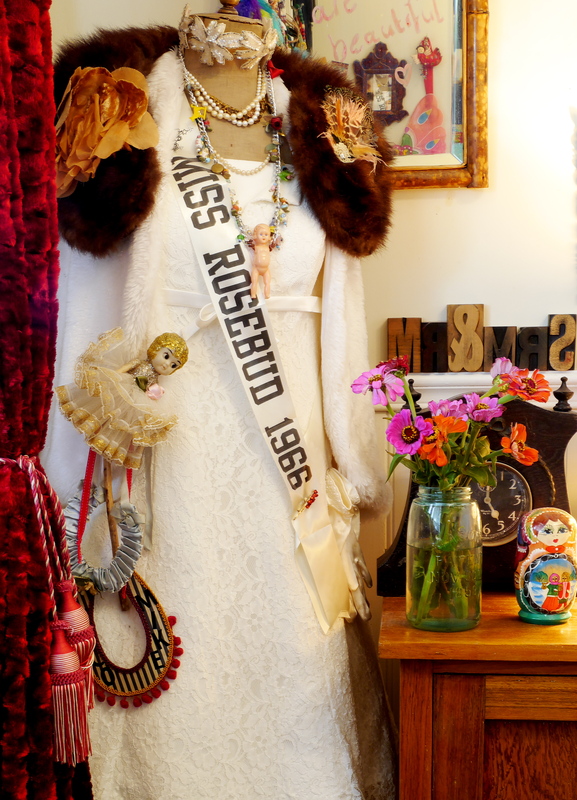 It’s filed under Uncategorized and tagged Antique mannequin, Antiques, Barsony, bedroom, Crochet, Patchwork, Textiles, Vintage, Vintage toys, Wedding celebrant. Bookmark the permalink. Follow any comments here with the RSS feed for this post. 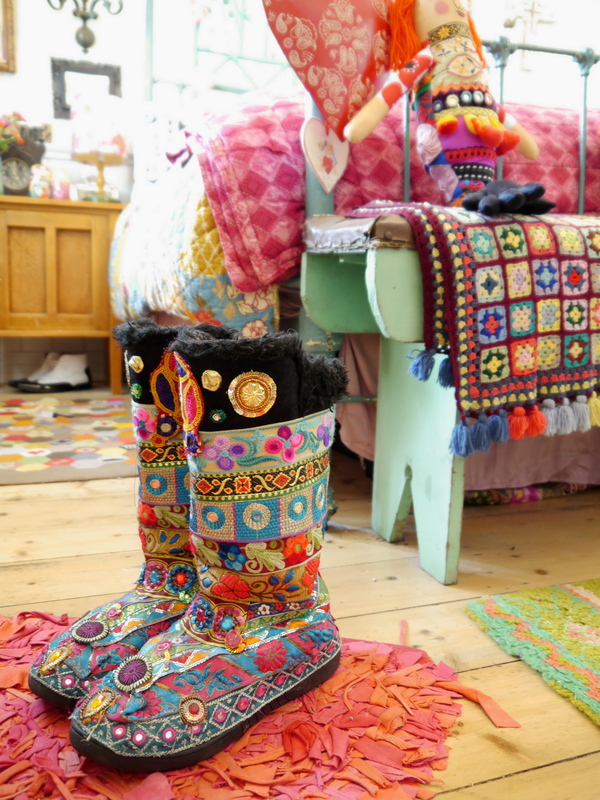 thank you for sharing your absolute lovely room in bohemian style and a bit of your life. I sincerely like it very much – it is such a pleasure to watch each photo – you made my day! I just found you by accident – I’m sure, I will come back. 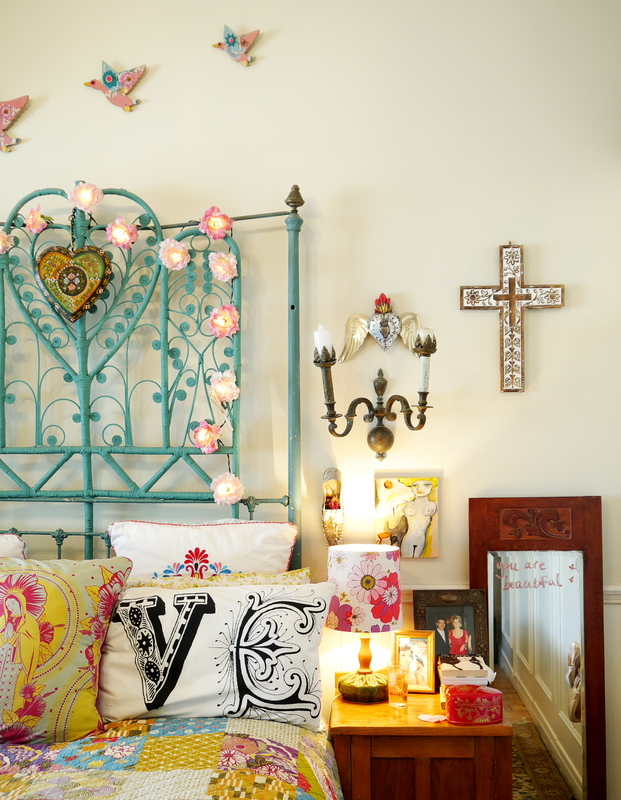 I want to replicate this room in every way! What a feast for the eyes! My idea of perfection! My eyes just nearly popped out of my skull! 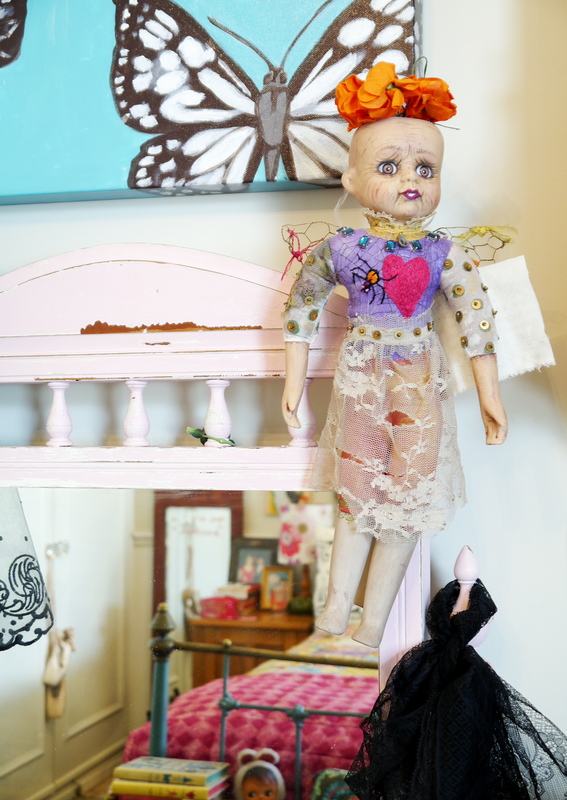 Coco’s bedroom is gorgeous, I love the doll made by Rebecca Cool and all the beautiful details. There is such much beauty to take in! VERY unhappy reading this article. Left me with total bedroom envy. Have ordered an industrial sized skip to remove the quite pathetic contents of my own boudoir. 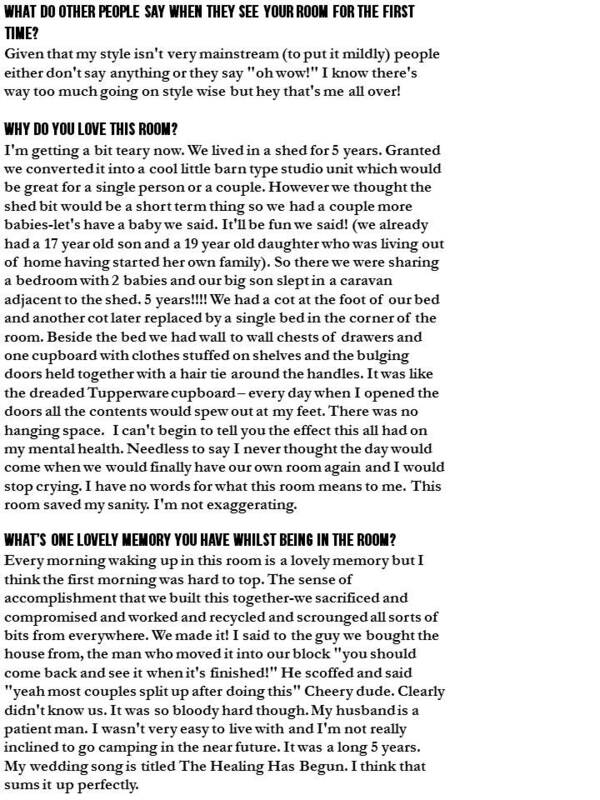 It’s too bad it’s not ‘The Rooms Illuminated’ – I would have loved to shoot the whole house. Only problem is Lamb, I think I’d still be there photographing…so much to look at! I have had the honour of visiting Coco and her gorgeous family. 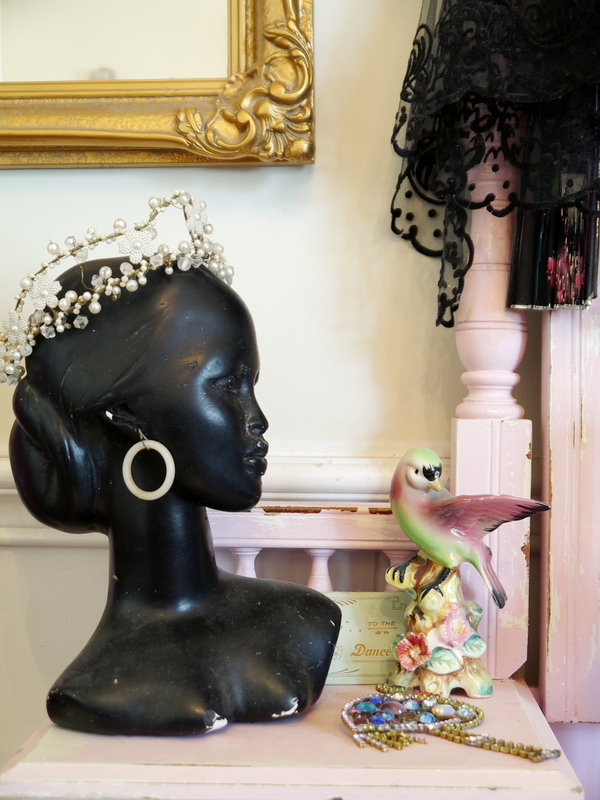 Every room in her house is exquisite, filled with rare and beautiful treasures. I have never seen anything like it, every where one looks is intriguing, like being a kid in the best toy shop you could ever imagine. Coco has a magical spirit to match too. Isn’t her house amazing Alyssa. I felt like a kid in a candy store! 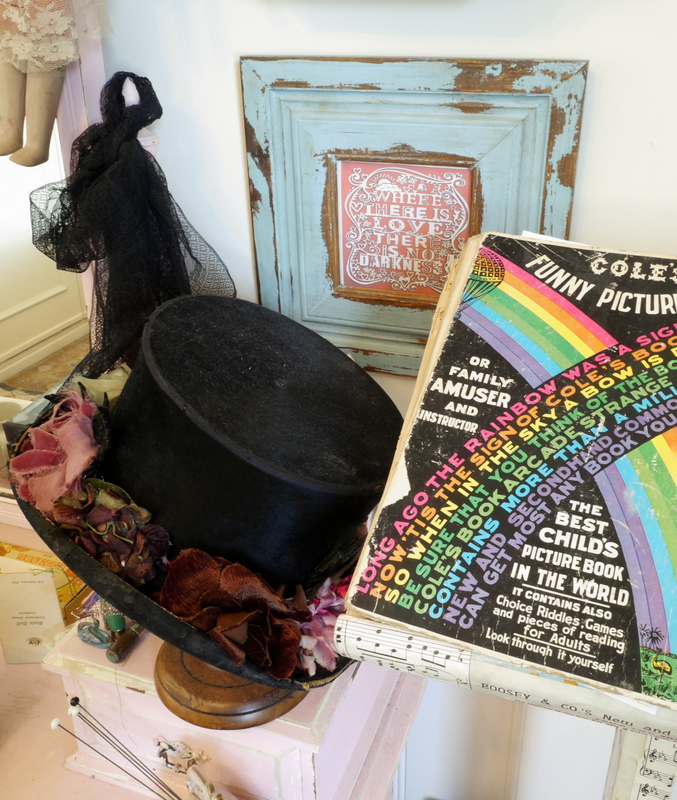 Totally gorgeous mix of colour and vintage treasures. 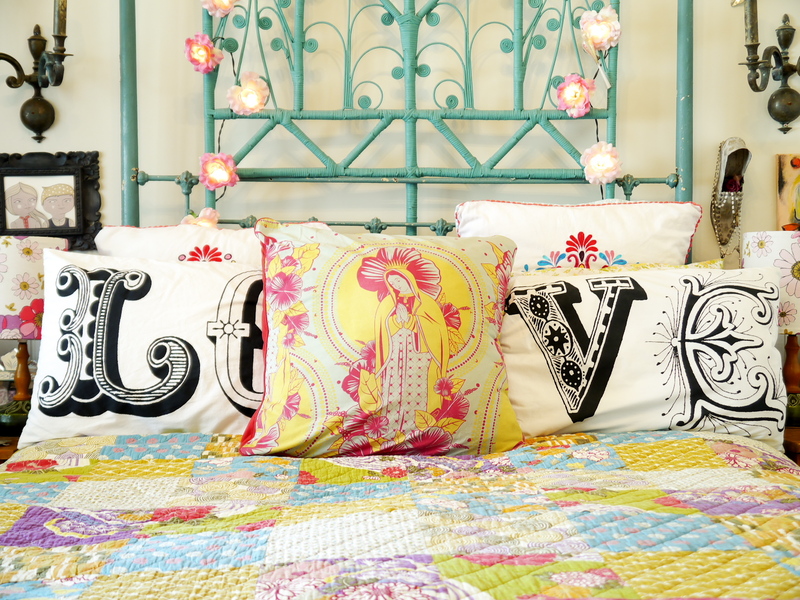 The perfect Boudoir! 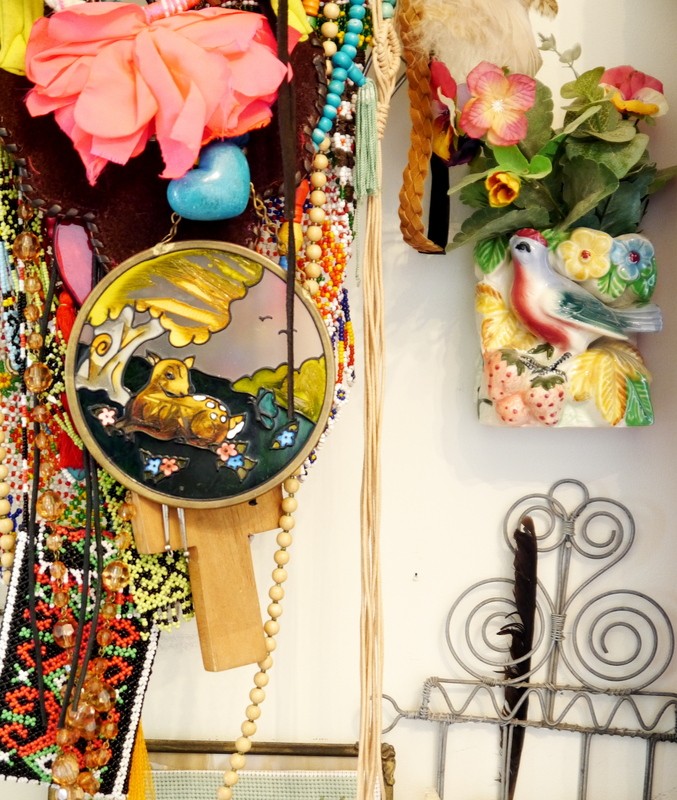 Totally adore the beautiful colours and the vintage treasures. 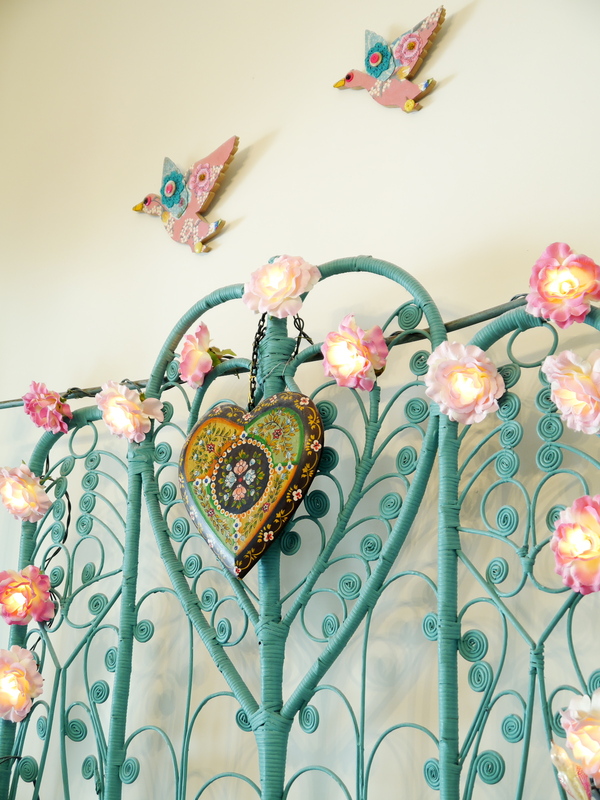 The perfect boudoir! It certainly is Liz, thanks for the comment. 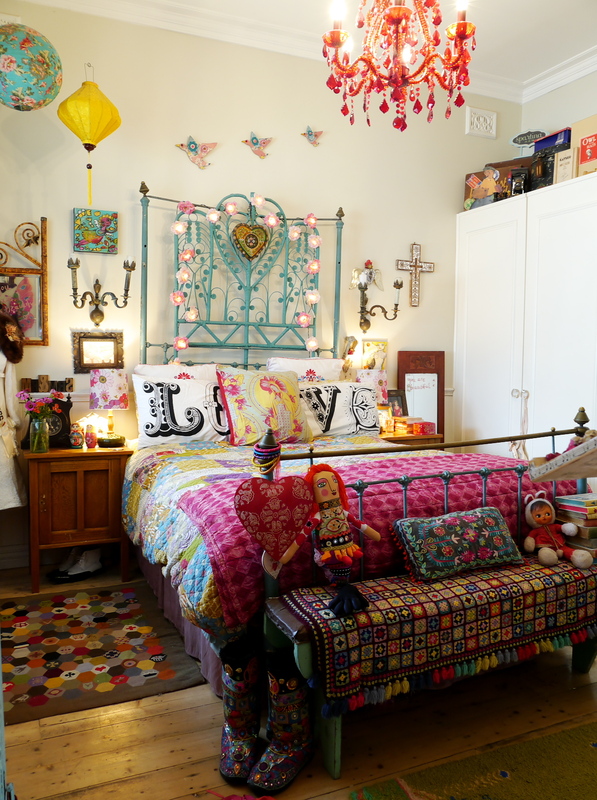 Nice to see a room that puts my love of colour to shame…I don’t do beige either – should be banned from the world. I also treasure my ya ya’s. Lovely room, thanks Kate and Coco. So glad you liked it Bec, beige is definitely is not! It is that Kerry…what a room hey! Oh Lize…your lovely comment was a great way to start my day. Coco will be chuffed!